Initiative has paid off for a Bangor University student who has recently secured a job at The Co-operative Bank in Manchester after impressing bosses during work experience. 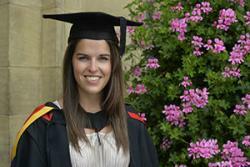 Former Audenshaw School pupil, Laura Elizabeth Larkin, 22, from Denton, Manchester graduates this week with an MSc Forensic Linguistics degree. Laura now works as a Threat and Vulnerability Specialist in IT Security at The Co-operative Bank. Celebrating her achievements, Laura said: “I came to Bangor as an undergraduate to study Sports Science and English Language. I wanted to study both subjects, and only a selected number of universities offered these subjects as a joint degree. I love Bangor, the setting, the atmosphere and the set-up of the course. After many family holidays in Wales, I was looking forward to being by the sea again in contrast to the city environment. “My original aim was to become a sports journalist or an English/PE teacher. However, during the second semester of the third year we studied a module in English called ‘Forensic Linguistics’, namely the study of language in line with the law. I loved it and found it fascinating. Once I’d graduated, Forensic Linguistics was introduced as a Masters degree. I applied and got onto the course, enjoying all aspects as it offered a different perspective on so many areas of language, from conversational analysis to cybercrime, the latter of which I found particularly interesting especially given its relevance in society at present. “After completing my MSc I started an extensive job search for Forensic Linguist jobs. However, this is a specific niche so I expanded to language/intelligence analyst-related jobs. I realised I was being held back by my lack of IT knowledge, so I applied to do work experience in the IT department of The Co-operative Bank in Manchester. “I learnt a great deal during my three weeks there, after which I was offered a role as the assistant to the CIO of Digital and learnt even more about IT analysis skills and general business too. Within this role, my Manager advised me to set up meetings with managers of different departments. Given my background and interest in Cybercrime, I met up with Head of IT Security for an overview of the department and what type of work it entails. During the course of the meeting he offered me a position in his department and I am now a Threat and Vulnerability Specialist in IT Security in The Co-operative Bank. “The Threat and Vulnerability Department is responsible for assessing any risks to the bank, namely through four main sources: hacktivism, organised crime, state-sponsored crime and internal/human error. Most of my responsibilities involve monitoring and blocking any incidents and on the odd occasion, forensic investigations. “I’m really enjoying it as it links to my background from my Masters, and unlike the other members of my team that come from a technical background, I was picked for having a linguistic background, therefore being able to offer a different perspective. Laura’s future plans are to become a Forensic Linguist and get more work experience in language analysis and promote it as a tool in criminal law. She will also be running in the 2015 London Marathon, fund raising for Cancer Research.